What Are Electronic Cigarettes / E-Cigs? Electronic Cigarette Overview.com is here to help you make an educated decision on whether electronic cigarettes are for you, and which ecig brands are best suited to your needs. We do not make any guarantees or promises on the quality of the products we review or the health benefits of the products. We only review the most reputable manufacturers, and we hope to help you choose the right product from among the top products available. Thanks for visiting our website and good luck choosing a suitable electronic cigarette brand product. If you have used any of the electronic cigarette products we mention please feel free to leave a comment review and submit a star rating! 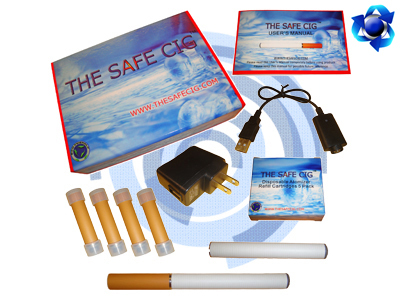 The Safe Cig is another top brand that we have been very impressed with. They utilize the two-part electronic cigarette design so each new vapor cartridge comes with a new atomizer to increase quality of vaporization. They also claim that their cartridges last longer than other brands. The Safe Cig aims to appeal to traditional smokers, and they only offer 3 flavors: Classic Tobacco, Traditional, and Menthol. These flavors have 6 different nicotine strengths to choose from. The hardware seems to be one of the higher quality products available and they offer a 30 day satisfaction guarantee and a lifetime warranty on the hardware. Their starter kits start at only $69.95 and come with 2 batteries, home / usb charger, and 5 refill cartridges. Potential downsides to the Safe Cig are that the starter kit does not come with a case and there are only 3 flavors to choose from. This product doesn’t try to be flashy like blu cigs, however, this is one of the better products available and if you are looking for an alternative to classic cigarettes the Safe Cig is one of the better choices out there. This product is very highly recommended. 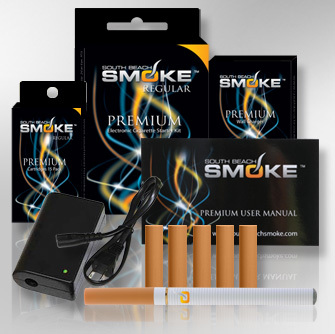 South Beach Smoke is a great option for those looking to get started with electronic cigarettes. First of all, their kits start out extremely affordable: $29.99. However, this kit features just 1 battery, and it is a lower quality e-cig with a separate atomizer from the cartridge. A small step up to $59.99 will get you two batteries (one normal and one long life), as well as cartridges that combine the atomizer and cartridge creating a better, more consistent smoking experience. They also have higher priced kits that include extra features such as usb chargers, carrying cases, and car chargers. South Beach Smoke e-cigs offer a variety of great tasting flavors: Cherry, Chocolate, Vanilla, Menthol, and Tobacco. So South Beach has a larger variety of flavors than some other manufacturers. Finally, for those who do not want to be concerned with ordering re-fill cartridges, South Beach may be the company for you. They offer an optional program at checkout thatwill send you monthly cartridges at a discount of 25%. This is a great feature to have for those who want to save time, and also want to keep on track with electronic cigarettes and not worry about running out of cartridges. 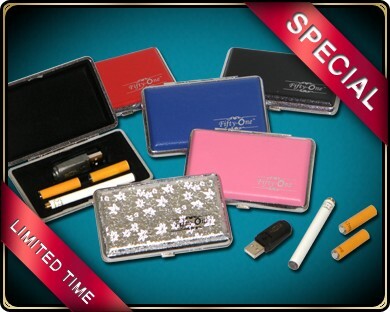 Some of the downsides of South Beach Smoke might be that due to their variety of options it can get confusing on which cartridges go with which electronic cigarette, and that the bottom and middle line kits do not include carrying cases or usb / car chargers. Overall a great product and some good options to pick from in both products and services. South Beach Smoke is definitely worth your try. Blu Electronic Cigarettes are quickly becoming one of the most well known brands of Electronic cigarettes. Their starter kits are reasonably priced and they offer 4 different flavor cartridges: Classic Tobacco, Java Jolt, Magnificent Menthol, and Cherry Crush. The Cigarette Hardware comes in two colors: Black and White. The starter kits come with a charging pack that looks very similar to a pack of cigarettes, this pack holds cartridges and charges your batteries on the go. This is a very cool feature that you will not find from other E-cig companies. The starter kit also comes with 2 batteries, and 2 ways to charge the batteries (wall and usb charger). Also, the starter kit comes with a 5 pack of flavor cartridges in the flavor and strength of your choice. This large assortment of features and accessories was why I personally chose Blu as my first electronic cigarette. UPDATE: Their cartridges have recently been re-designed to have a single atomizer per cartridge. This is similar to the system “Safe Cig” uses and improves the quality of the vapor, and I have found that these new cartridges last much longer than the old design. Smoke51 has gained quite a bit of the Electronic Cigarette retail market by selling products locally. If you have seen electronic cigarettes in your local mall, there is a good change they are smoke51. This is good, because most retail kiosks let you try out the product in person! What better way to find out if you like the smoke 51 product. However, note that purchasing online can be much more affordable than purchasing the electronic cigarettes in your local mall. But if you cannot wait for refill cartridges or your first starter kit, a local smoke51 retailer might be the best bet. On to some specifics on Smoke 51 starter kits. The starting price is $55.97 (must use a link from this website and use coupon code: DSC-5623). The starter kit comes with 1 battery 2 atomized cartridges, a usb charger, and a very cool carrying case (various colors). The Smoke Fifty-One electronic cigarette is also a two part design that has the atomizer within the disposable cartridge. There are two flavors: Tobacco and Menthol, and 4 nicotine levels to choose from. A few potential downsides to this product are: only two flavors (tobacco and menthol). Also, the cheaper starter kit only comes with 1 battery. However, there are alot of starter kits to choose from with many different options. All of the starter kits have a major discount when you use our exclusive discount code: DSC-5623. Overall the product seems pretty solid and works well, plus you might be able to try one out at a local shopping center! 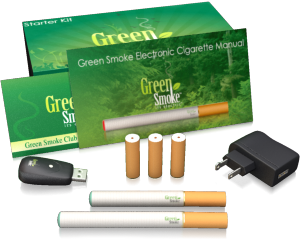 Green Smoke Electronic Cigarettes are one of the top selling brands for a reason. While their starter kits are a bit more expensive (starting at $109) than other available brands, there are many good reasons to choose Green Smoke to serve your electronic cigarette needs. They have a ton of flavors offering great taste. Flavors include: Tobacco, chocolate, coffee, menthol, regular, vanilla, apple, and strawberry. They boast of high quality hardware with disposable cartridges that offer more smoke volume than other leading brands. They combine the cartridge and atomizer to ensure the smoke volume and quality is consistent for each cartridge, while most other brands have the atomizer as a separate component that is re-used for many cartridges and can wear out. Overall Green Smoke is a great brand that offers alot of benefits with the only downside I can see is the cost is a bit higher than alternatives. If you are looking for a higher quality cartridge with a large variety of flavors and nicotine levels green smoke e-cigs are for you. 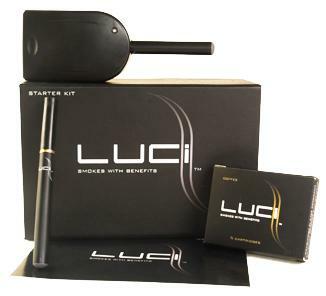 Luci is a very sleek, and stylish option for electronic smoking. I was impressed with their product functionality and overall quality. Lets get right to the details of their starter kit, the starting price is very reasonable starting at $54.99. The start kit includes 1 Atomizer (with lifetime warranty) 1 battery, 1 home charging kit, and 5 Full-Flavor cartridges. They have a decent selection of cartridge flavors: Full- Flavor, Menthol, Coffee, and Cherry (The luci flavors are quite good!). Each flavor has 3 nicotine levels to choose from. A few downsides to Luci Electronic Cigarette Starter kits are: The starter kit only comes with 1 battery and atomizer, only 3 levels of nicotine, and the starter kit does not come with a carrying case. The Luci product is great and the price is right, but I would like to see some more options in the more affordable starter kits. However, there are various types of starter kits with many more options, and luci is a very solid product with great customer service. This product is highly recommended if you are looking to get started with E-Cigs. You can use the following Promo Code for $5 off your first starter kit: 4c6048cba4a35 *you must use a link from this website for the coupon code to work.